We continued excavations at the Lost City of the Pyramid Builders on the Giza plateau, this year focusing on the office-residence of a high official. We began the process of getting our Sphinx data online and publicly available in 2017. This data is from the only systemic survey and architectural study of the Great Sphinx ever done and includes over 8,000 documents. We continued our work with the Glen Dash Foundation survey at the Great Pyramid, focusing on the marks left by the ancient builders that offer insight into their building methods. We entered the second year of our USAID funded project to develop Egypt’s cultural heritage infrastructure at the ancient city of Memphis, bringing back to life this once-great city, Egypt’s capital through much of Pharaonic history. We’re completing work on a walking circuit for Memphis visitors, adding seven new sites to the one currently open and producing guide books, signage, a museum catalog, and other informative materials for visitors. We’ve trained 46 Egyptian field school students at two field schools, helping to build the future of Egyptian archaeology. 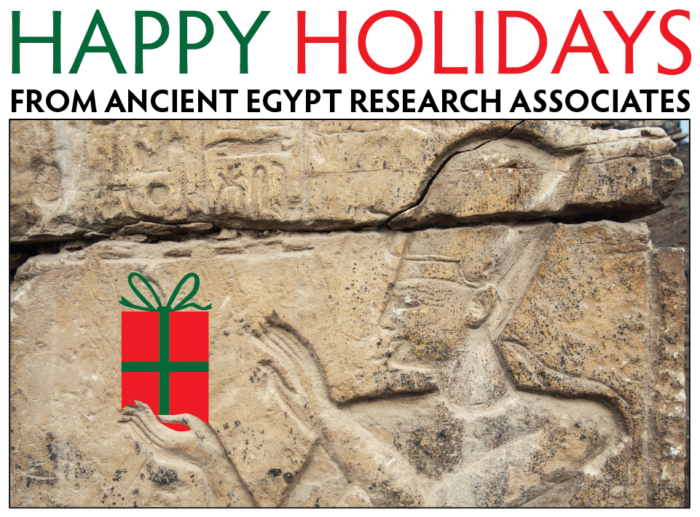 In 2017, we hope to continue advancing archaeological research and conservation in Egypt, while promoting cross-cultural and educational exchange, training, and support for young Egyptian archaeologists. All of our work is made possible thanks to the support of our members. Join our adventure of discovery. Become an AERA member and help us explore further. Thank you to our members and the outstanding team who make our research and training possible. We look forward to continuing the adventure with you in 2017! Our members help make possible our excavations in Egypt, field school training, rescue archaeology, conservation, education and outreach. Members also receive printed copies of AERAgrams and annual reports as soon as they are published. Help us keep our field programs vital and effective by becoming a member or giving a gift membership, by donating to AERA or by directly sponsoring an area of research through our giving catalog. AERA is a 501(c)(3) tax exempt, nonprofit organization. Your membership or donation is tax deductible.